WBPSC Civil Service Syllabus 2018-19 Here is the good news for all the candidates who are looking for WBPSC Civil Service Exam Syllabus PDF. The latest WBPSC Civil Service Exam Syllabus and WBPSC Civil Service Exam Pattern are available here. So, the aspirants can easily download WBPSC Civil Service Exam Syllabus and WBCS Exam Pattern at a free of cost from this page. For your guidance, we have also uploaded WBPSC Civil Service Exam Previous Year Question Papers on our website. Therefore, you can download WBPSC Civil Service Exam Solved Previous Year Question Papers PDF from the link given below. Aspirants who are really in search of Wbcs Syllabus 2018 Pdf Download you are on the right page. Here we have Wbcs Syllabus 2019 Pdf Free Download, WBPSC Civil Service Exam Pattern and also WBPSC Civil Service Previous Year question Papers. West Bengal Public Service Commission (WBPSC) has recently issued notification for conducting West Bengal Civil Service Exam 2018 to hire the qualified candidates for the Civil Service Posts (Group A, B, C, D Posts). The WBPSC Board is going to fill a various number of vacancies through this WBPSC Civil Service Exam Notification. Most of the eligible and interested candidates have been applied for these WBPSC Civil Service Jobs 2018. The WBPSC selection process includes two levels of written test – Prelims and Mains. So, the candidates need to download WBPSC Civil Service Exam Syllabus and WBCS Exam Pattern for the best and effective preparation. Candidates who are going to appear for WBPSC Civil Service Exam 2018 are facing problems in finding the WBPSC Civil Service Exam Syllabus and WBPSC Civil Service Exam Pattern. Hence, for the sake of all those individuals, we have uploaded the WBCS Syllabus and WBPSC Civil Service Exam Pattern on our website. Therefore, the candidates can easily and quickly download WBCS Civil Service Exam Syllabus and WBCS Exam Pattern from the below sections. Along with WBPSC Civil Service Exam Syllabus, it is very much necessary for the candidates to download WBPSC Civil Service Exam Model Papers and solving them. Since by practicing WBCS Previous Year Question Papers, the individuals can improve their solving skills and also they can know the structure of the WBPSC Civil Service Exam Paper. You can download WBCS Solved Previous Papers by clicking the link given below. The WBCS Exam is of objective type. There will be 200 multiple-choice questions. The WBCS Mains Exam comprises of six Compulsory papers and 1 optional Subject of 2 paper (Only for Group A & B applied candidates). This exam consists of overall 8 Papers. Each paper contains 200 questions and carries 200 marks each. The time duration of each Paper is 3 hours. The complete subject wise WBCS Syllabus is as follows. Translation from Bengali/Hindi/Urdu/Nepali/Santali to English etc. Translation from English to Bengali/ Hindi/ Urdu/ Nepali/ Santali etc. Including the main features of Indian Agricultural and Natural Resources with special reference to West Bengal. Knowledge of the country‘s Political System. Community Development and Planning in India. Biodiversity and Coastal Regulation Zone. Objectives of five years plan. Role & Functions of RBI. Functions of RBI and Monetary Policy. Fiscal Policy of Government of India. The forcefulness of the Arguments. 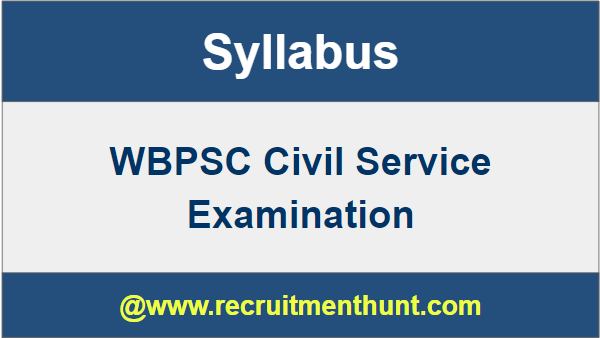 Finally Candidates can download WBPSC Civil Service Syllabus here. So, Applicants can make their preparation easier by following WBPSC Civil Service Previous Year Question Papers. Download WBPSC Civil Service Exam Patterns along with WBPSC Civil Service Previous Year Question Papers 2018-19 on this article. Also, For more Job Updates stay Tuned to our site Recruitment Hunt.